What’s stenclin’ my crafty DIY chicas! Did you enter our awesome Lucky #7 Stencil giveaway? If you missed it yesterday then let’s just back up a minute to give you the 411. 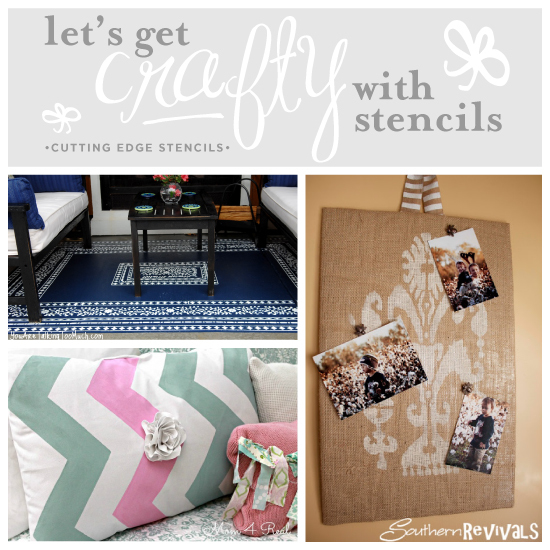 Cutting Edge Stencils partnered with the 7 amazing DIY craft blogs and each blog completed an awesome stencil project and is now hosting a chance to win a free stencil worth $75. Did you have to rub your eyes to make sure you read that right? It’s quite possible this is one of our largest giveaways to date, so make sure you enter! Now onto the craft stencil ideas that I was talking about! As I mentioned, each one of those DIY bloggers chose a stencil to use for a home decor project. After all stencils are an easy and inexpensive way to spruce up your home decor. First up is Rebecca from the blog You’re Talking Too Much. She’s the crafty gal behind this gorgeous Indian Inlay stenciled outdoor Persian rug. I absolutely love this, don’t you? Last summer, Rebecca redid her outdoor sitting area and while she thought it looked great; it was missing something. Rebecca put her thinking cap on and decided to try stenciling her own outdoor rug to match her sitting area. 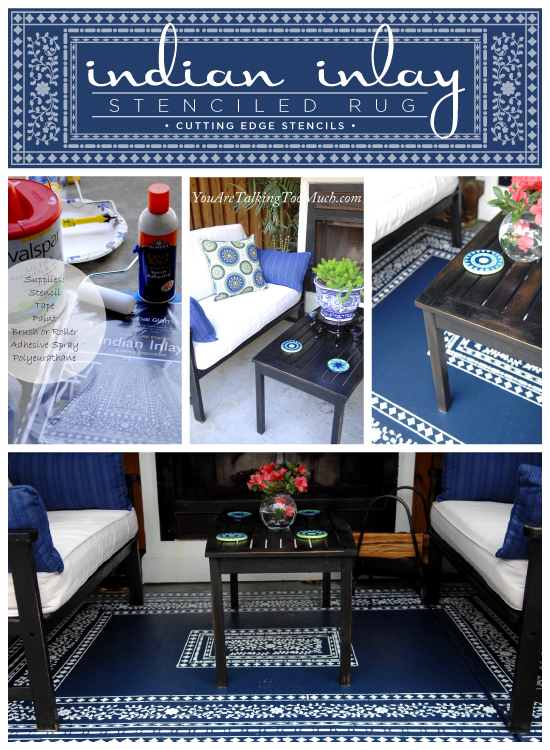 Following the simple stencil steps on the back of the package, she painted a gorgeous stenciled outdoor rug. She even says, “This was one of the EASIEST projects I have ever completed.” The color of her rug also really brings together our outdoor seating area and gives it a complete look. This rug is so stunning it’s kind of hard to stop staring at it, right? Make sure you enter her giveaway here. Meet Jamie, the super crafty DIY mastermind behind the blog, Southern Revivals. Jamie had lots photos to display and very little time do so. What was her solution? An absolutely stencil’rific one! 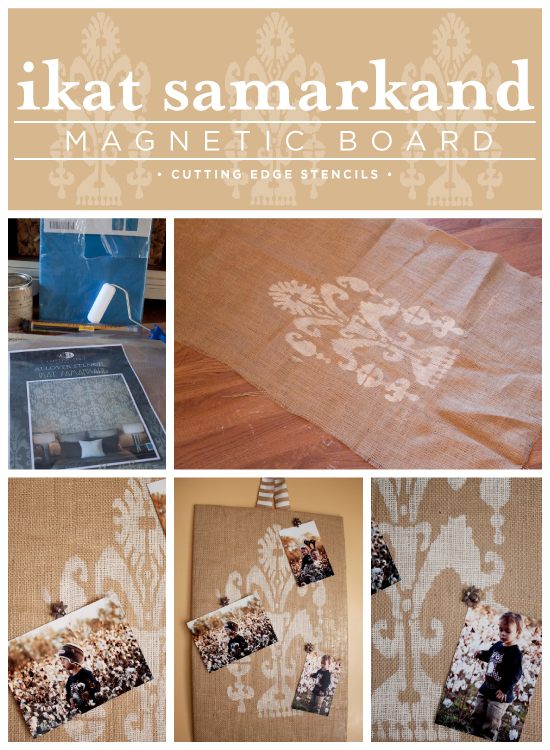 To stencil her own magnetic memory board using some burlap, a left over metal sheet from another project and our Ikat Samarkand Stencil. As Jamie says, “And nothing beats a trendy Ikat design.” We gotta agree with your there! Now she has the perfect accent to her space where she can display some pictures of her adorable little boys. Jamie wanted an simple decor project and I’d say she achieved it! Hop on over and enter her giveaway here. Lets jump on over to visit Jessica, the fabulous frugalista and home decor enthusiast behind the blog Moms4Real. Jessica explains that through a series of bed swapping in their house, her daughter ended up with a full size bed that just appeared a little bare. While she wanted to give her daughters space that finishing touch, she didn’t want to spend the moohla on those designer throw pillows all over Pinterest. Her solution? 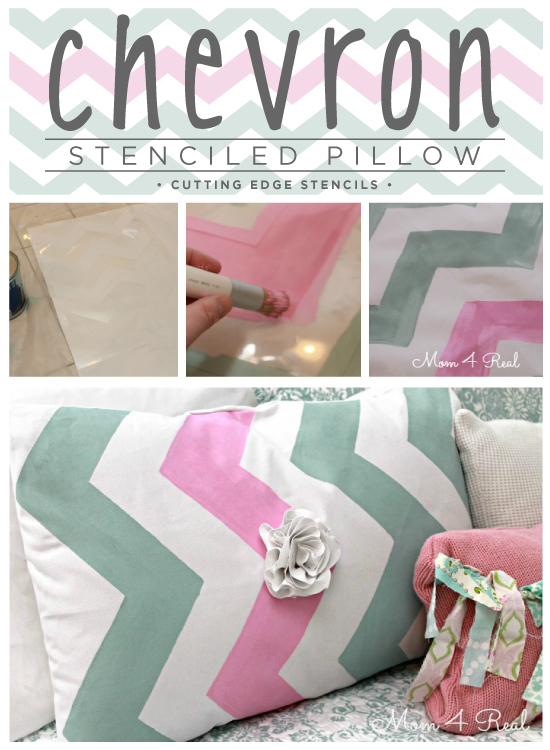 Jessica created this adorable throw pillow using our Chevron Stencil in matching colors. She tells her readers, “I love the way this pillow turned out…stenciling pillows is so easy and inexpensive…it’s one of my absolute favorite things to do!” Don’t forget to enter her giveaway here. Which of these three stencil projects would you be mostly likely to try? Have you completed a stencil project? Come share your photos with us on Facebook! Shop our stencil collections to find the right one for your project! Cutting Edge Stencils Lucky #7 Giveaway! Make Everyday Items Sparkle With A Stencil!